I bet lots of Now Smell This readers can relate to the following scenario: you’re in, say, Paris (somewhere “foreign,” far from home) and you find yourself in one of those shops that sells expensive little rarities — red silk Chinese lanterns with hand-painted calligraphy, tiny porcelain monkey figurines from Thailand, gold-and-horn letter openers from Kenya, babouches from Morocco — and you come across a gorgeous box of soap; each hefty bar of soap is wrapped in handmade paper and tied with a heavy ribbon. The scent of the soap is lovely but you don’t recognize the manufacturer, have never heard of or seen this delightful product before. The enticing perfume rising from the box of soap makes you imagine using it back home: it will make you feel confident and happy, it will remind you of your trip, it will make you feel rich and glamorous. You look at the price tag: the box of soap is $120 — $40 a bar! Smelling Prada Infusion d’Iris and Prada Infusion d’Homme makes me think of wonderful, high-quality soaps, expensive soaps, but both fragrances are much less expensive than many boxes of soap I’ve bought over the years. Prada Infusion d’Homme was developed by the creator of Prada Infusion d’Iris — Daniela Andrier — and it contains neroli, iris, vetiver, cedar wood, incense and benzoin. The ingredients in Infusion d’Homme are not so different from those in Infusion d’Iris (mandarin, orange blossom, galbanum, iris, incense, benzoin, cedar, lentisk and vetiver) but they are used in different proportions. In a Wallpaper article, Andrier said she wanted the scent of Infusion d’Homme to mimic the smell of a man who had bathed with Infusion d’Iris soap. ...wildly innovative, but it has a kind of quiet elegance that isn't often found in mainstream designer offerings, and it is so nice to find something in a department store that doesn't smell like it has been focus-grouped into banality. Infusion d’Homme is perfect for a day when you want only a hint of fragrance on your skin or when you don’t want others to be aware of your perfume (Infusion d’Homme lasts over 10 hours on my skin but stays close to the body). Infusion d’Homme would be great to wear on a long-haul flight: you’ll smell clean and “freshly showered” but your perfume will not be intrusive. I’ve been waiting for Infusion d’Homme’s debut before buying a bottle of Infusion d’Iris (which I also like); both scents are unisex to my nose. At the moment, I can’t decide which of these perfumes I want to buy; I only need one because they are so similar (Infusion d’Iris has more iris and Infusion d’Homme more incense and benzoin). In the meantime, I’m heading to the store to buy the Infusion d’Iris soap — $42 for two bars of soap! Prada Infusion d’Homme Eau de Toilette comes in five sizes: ranging from 50 ml ($54) to 754 ml (that’s over 3 cups of fragrance!) for $275; grooming and bath products are also available. As always, love the story vignette, Kevin, although I think you're out of your gourd to buy a $40 bar of soap — I do mean 'out of your gourd' in the most friendly way, however (I also need to Google 'babouche' as I've probably seen one but don't associate that word with anything). Also, I use shower gels, so I'm safe on the expensive soap front (though perhaps less safe when confronted with monkey figurines)! I have a sample of Id'Iris, and it seemed “nice enough” but not a “have to have.” I need to test it again. I might enjoy a bit more incense, so I'm curious to try Id'Homme. Not sure how I feel about light skin-scents, though… I'm getting to the point where “light” scents drive me up the wall — I want something a bit more BOLD that lets me smell a bit of my own sillage, if you know what I mean. Especially if I'm shelling out good money — I want my perfume to make an ENTRANCE (without offending, of course!). I didn't expect to love this one, but I do. The effect on my skin is not so much of a skin scent, but the sense that I am walking around in a cloud of scent, not coming from any particular direction. And it lasts a good 8 hours or more on me. A winner in my book. March: they are very comfy slippers — still regret not buying 10 pairs in Morocco! Rosarita: a candle would be nice in this scent. Great review (and story) K.
Yes, those expensive soaps and their strange siren call. Maybe we just romanticize showers too much. Or maybe we just enjoy the smell of a well fragranced shower more than other people. Who knows…I can realate though. I like this scent as a 'soapy' scent – not as an iris scent. It's much cheaper than Puro Lino (which I LOVE!) and much more interesting than Clean Men or Chemistry by Clinique (which just smells like Ivory Soap). It fills that void – mid luxury soapy scent, nicely. Iris? I'll stick with my newly acquired bell jar of Iris Silver Mist. Or L'Homme Coeur by Divine. Mike: a PERFECT categorization of this one; and Iris Silver Mist is a whole other animal, isn't it? Nice post Kevin. I love soaps, too (though I'm perfectly happy with a 5€-Roger-Gallet). And soapy fragrances… We discussed Id'H a bit at the Infusion d'Iris post. I bet this will be a success. “It's not wildly innovative”, yes, but in this price range it is unrivalled. Wonderful. I'd say I prefer Infusion d'Iris but then the bonzoin intrigues me (now I believe that's what I always think of as a “plasticiser note”), so I'll ponder well before purchasing one. In any case it's already safe to say: Dio ti benedica, Prada, for an inspiring contribution to men's perfumery. Wonderful story Kevin! This 'reasoning with oneself'.. I do this too, all the time. You know, why don't you buy both Prada Infusion d's, of each bottle a smaller version. Will try Infusion d'Homme tomorrow. I have Infusion d'Iris and I love it!! It's amazing how unisex there impression is. Really unusual for two succeeding mainstream releases… I just was a bit disappointed about the vague neroli note. I expected more of a “walk through an orange grove”. Great review! I have to say I really, really like this one. It's so understated and elegant. A very classy fragrance. I just wanted to ask… you say that this smells like soap.. It makes me curious as to how much does this fragrance smells alike the previous Prada Amber pour Homme (or Prada Homme if you like). The Prada Homme to me smells of expensive soap, but is not as “close to the body” as this new one appears as per your review..
How do they stack up toghether? are they similar? wildly different? Riverwide: yes, one of my favorite new releases…if only all of them were so pleasant. As always, Kevin, a beautiful and entertaining, well-researched article from the Master himself! I didn't even have to see your name at the opening of it to recognise your signature writing style. Yes, I've been curious about Infusion d'Iris and Infusion d'Homme as well, so armed with the knowledge I now have, I'll test them out here in Perth, Western Australia – yes, oddly enough we actually have these fragrances in the department stores as well. Finally! Someone who thinks like me. joe805, you have my sentiments – I too want a perfume that says I'm wearing perfume and I want to smell my own sillage as well. Like you, I don't see the point of wearing a discreet, light scent except on depressing days when I want to feel utterly unobtrusive. I still will try everything I can, but I know what I like – my two next conquests will be Virgins et Torreros and Infant Divine by ELd'O. Kevin, I have the same problem! A few women in my workplace asked me what gorgeous fragrance I was wearing one day and I had to repeatedly respond with “Delicious Closet Queen” – the looks on their faces every time I mentioned it was worth the shock value alone! It's come to a point where they don't bother asking, as they know it's going to be something shocking or completely unpronounceable in English and they'd never dream of buying it for their husbands anyway. I really enjoy your articles, Kevin. Like you, I'm a nut about soap. For me there is something about the lathering up with a beautiful bar in my hands, whether it be scented or not. The liquid soaps and gels simply do not satisfy. And thank you for the reminder that I need to sample Infusion d'Iris. I'm curious where it falls among the few iris I've tried, which include Hiris, Iris Silver Mist (MikeP, you must be so excited about your new bottle! ), and Terre d'Iris. I like all of them lots. In a nice Prada cosmetic pouch, yes please! Prada, are you reading this??? I think this is one of the most disappointing fragrances (of a long line from mainstream houses) this year. 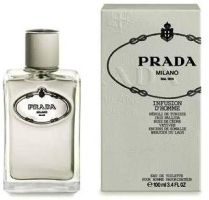 I sampled this four or five months ago when I met a Prada rep in a department store in London. I was almost shaking with anticipation. What a disappointment! Let's not kid ourselves here. What we wanted was a male version of Infusion D'Iris, what we have had delivered is a Neroli bomb. Neroli in the top notes, neroli in the heart notes and neroli in the basenotes. That's not what it says in the note pyramid of course. But then the description of Paco Rabanne Million is far more exciting than the actual fragrance which is vile. So what does Infusion D'Homme deliver then? Well It's a creamier orangey smell than say, Eau de New York, tempered only by a smidgeon of Iris trying to wave above the forest of neroli. To my nose this is a fairly linear fragrance that, after Prada Amber for Men is not in the same league. I have tried this recently to see if I got it wrong. I didn't, it's an overly persistent fragrance, unsubtle and unworthy to my mind of the price of a bottle. I wouldn't even buy this if it were cheap on Ebay. I would buy Cologne de Fleur du Male instead, which is far fresher, more interesting a scent journey and far better engineered as a fragrance. I have to say, I too, have a soap fetish! I have a huge bag of them as I don't seem to be able to resist a beautifully scented soap. When I travel, I almost certainly will end up with at least a soap a day whilst i am away. desmondorama: yes, in my case, the French phrases always get a sigh and shrug! Haunani: thanks, and I think one of the reasons I choose soap over bath gel is the turnover rate! Soaps go quicker and thus: a NEW scent each week. HDS1963: Ah, the NOSE. A Neroli bomb to you is a “vague neroli” to Lars above! And the neroli was just right for me. Does this remind you of a certain fairy tale? AussieBec: I know…on trips I always look for a new soap/soap maker. Interesting to read this comment — and it scares me, as I have an aversion to neroli bombs. However, nothing says “soapy” to me like neroli (and I can't stand Fleur du Male except maybe as room spray). Kevin, even though the amount is just right for you, does IdH really have noticably more neroli than IdI? It's such a shame you don't review soaps here! If I've learned that best candles are Dyptique, I can't imagine what are best soaps. I don't have a problem with Neroli as it goes, indeed Cologne de Fleur du Male has that orangey feel to it, but does it in a fresher and more subtle way. One of my favourite Penhaligon's is Castile which (amongst other things) opens with Neroli. I just think this is too linear and whilst it might, as you suggest, make an excellent soap, I think it comes off a poor second to other Pradas as a fragrance. Joe I wasn't talking about Fleur du Male. I was talking about Cologne de Fleur du Male which is new and very much a superior fragrance to the original Fleur du Male. So much so it's the only JPG fragrance I would consider buying. Personally I think there IS noticably more neroli in IdH than IdI, where the prominent note is Iris. in IdH the prominent note is neroli. My first impression also was: disappointingly linear. Which is why I prefer Id'I. But still, I don't agree on the Neroli… But then, I've only tried it once so far. Will try them next to each other the next time I get the chance. Interesting what you say about the new cologne version of FdM! I found the original a bit boring, so might like the Cologne version. I've tried Infusion D'Homme a few times now and just can't like it I'm afraid. I'm wearing the Cologne of Fleur Du Male at the moment (I was in a shop earlier that had it) and it really is a very elegant fragrance, much nicer than the bombast of the original. JPG's FdM is my favourite perfume and I like it even better than the original version of Le Male. I tried the EdC version of FdM and thought it was like mixing a bottle of FdM with a bottle of 4711 Original Koln Wasser eau de cologne. I couldn't see the marketing point and to what audience it would appeal to. I'd like to buy it, but think it would be a waste of time and money and I'd be better off with the full-strength version. I think it appeals to people like me who like male florals but don't like the vast silage and power of the original FdM. Don't get me wrong I like fragrances with good silage but FdM is vast. Also I find the original too powdery in the drydown for my liking. I just bought Infusion d'Homme and I can't tell the difference between it and Amber Pour Homme. Ernst: I'm assuming you mean you tried both fragrances in a store and decided on Infusion d'Homme (and not that you already owned Amber Pour Homme). Each scent is “soapy” but I don't find them twins at all; in fact, when I smell Prada Man/Amber Pour Homme I'm not tempted to buy it…but I really liked, and want, Infusion d'Homme. I own both, but you're right they're not that similar. It was my first impression I guess. OMG I AM IN LOVE!!! Dropped by the city boutique today and they had just received the stock. It was love at first inhale! It just struck me – this wonderful scent. I think it's somewhat different to the women's, and am so glad I held out for the men's to arrive. 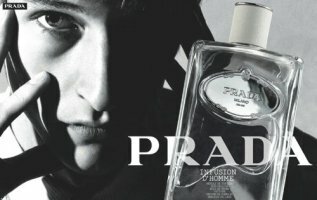 I’m still undecided about this, it has that kind of sharpness all Prada perfumes have that make me fell uncomfortable. but I like it. it’s nice and clean. and you can tell the same person created both this and infusion d’iris because they’re nearly the same exept d’homme is more quiet and there’s hardly anything to it. For me it is the one of the scents for every ocasion. classic, but so modern in the same time. timeless!